My name is Chris Griffiths. 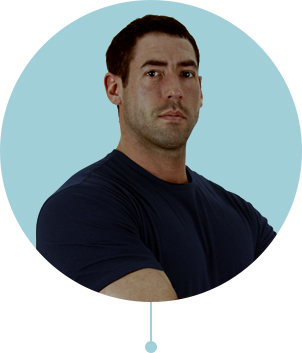 I have been a personal trainer, strength coach and injury therapist for 11 years. Now, I am a business owner with Advantage Fitness (AF), the newest gym in your area. I have founded AF with the passion to offer you a fantastic gym experience, totally different from run of the mill monotonous gyms. Why did I start Advantage Fitness? As you are aware, recently gyms are taken over and run by big corporate companies all around the country. These corporates have huge budgets and national marketing campaigns. Am I crazy to compete with these corporate gyms? Being in the fitness industry for more than 10 years, I know how these gyms operate. I can instantly spot so many glaring glitches and obvious pitfalls in almost all of these gyms. The equipment’s are all standard everywhere and are usually manned by trainees and apprentices with no relevant experience and qualification. They also add loads of unwanted facilities just to tick boxes for their corporate clients. After all these corporate gyms are designed for their annual profits, share prices, margins and dividends for their shareholders. Most of them are centrally operated and nobody bother to care about their clients, their individual situations, their goals, their results and that special personal one to one experience. This where I believe AF can make a big difference. AF can offer that personal, results based gym experience for people of all ages and abilities. How AF is different from the rest? Advantage Fitness has top of the range Watson kit, custom built to specifications. Each bit of kit is the best available in the fitness industry and vouched by gym training experts. Rather than using typical machines that promote a limited range of movement, our equipment’s are designed to maximize the range of your movement and thereby your end results. We have everything from lifting platforms and bumper plates to the glute-ham raise and reverse hyperextension, with new pieces of kit being added soon. Each combination (chest, leg etc.) has been colour coded to improve your training experience and to help you to navigate the gym, it looks pretty cool as well. In addition, cross trainers, rowing machines and bikes will help you warm up or perform your cardio sessions. Every piece of equipment in AF are carefully handpicked after much deliberation by myself and my fantastic team of fitness coaches, each of them an expert on their field. Of course we also boast of thoughtfully designed male and female change rooms, ample car parking spaces, central air conditioning, great music, family friendly environment and therapy rooms. With all of these, I sincerely think that we can offer a fantastic gym experience for you. I also strongly believe that you will support your local business, started with the sincere ambition by a local guy. Our prices are very reasonable starting from just £40 per month on pre-paid annual pass or £44 per month on monthly pass via direct debit. No off-peak and peak prices and you can visit anytime 7 days a week. We are open 6AM – 10PM, weekdays and 8AM-6PM, weekends. We are conveniently located for both Thatcham, Newbury residents on the green lane behind ATS euro master and American Golf shop on the A-4. We also welcome residents of the surrounding villages of West Berkshire. We have a few clients further away from North Hampshire and East Wiltshire villages. After all AF is the largest of its kind gym from Swindon to London (as far as I am aware) and so it is definitely worthwhile for you to join AF, even if you live little further afar. I would like to invite you to visit our gym. Myself or someone from our team will walk you through the gym, the equipment’s and all the facilities. No obligation to join and no sales pressure. Why don’t you pop in sometime this week?